Welcome to the Hotel Le Due Fontane Florence. Comfortable, friendly and elegant, the 3 star Le Due Fontane is the perfect choice for those wishing to marvel at the artistic and historical riches of Florence. This 3 Star Florence hotel is located in one of the most renowned piazzas of Florence: Piazza della Santissima Annunziata. This piazza is lauded for its great stylistic harmony to which some of the greatest renaissance architects contributed. Complementing the glorious surroundings of Florence, Le Due Fontane is distinguished by its beautiful and pleasing appearance. The neo-classical building was completely restructured and provides 57 elegantly decorated rooms. Click here to take the Le Due Fontane 360 Interactive Virtual Tour and sample from the comfort of your own home a small taste of Florentine style. Situated just 200 metres from Il Duomo, Le Due Fontane is ideally situated for walking to the various historical and artistic gems that are waiting to be discovered in the Renaissance City. Click on the Location page to find out more about the historical city centre itself and the places of immeasurable historical interest nearby. If your trip to Florence is business related, Le Due Fontane is furnished with many of the facilities required. At the disposition of our guests is our meeting room with a capacity of 25 people. 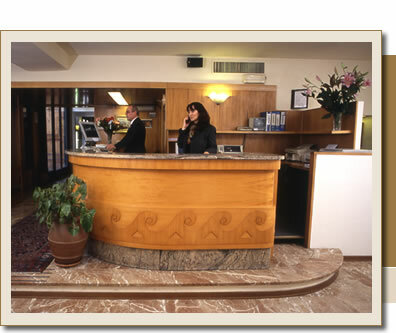 For other services within this Firenze hotel check our Services page. To check availability at Le Due Fontane Hotel Florence in real time, click here. Special offers and last minute bargains are frequently available to guests who book with us directly.